In Phoenix, 'Zombie' Subdivisions Rise From The Dead During the Great Recession, whole neighborhoods in Phoenix were left half-built or mostly vacant. But now developers are buying these lots to keep up with the high demand for housing. The market isn't where it should be, but it's better than it was two years ago, one real estate agent says. Workers frame a home in Gilbert, Ariz., near Phoenix, in July 2012. Developers are buying up half-built and vacated subdivisions amid renewed demand for housing. 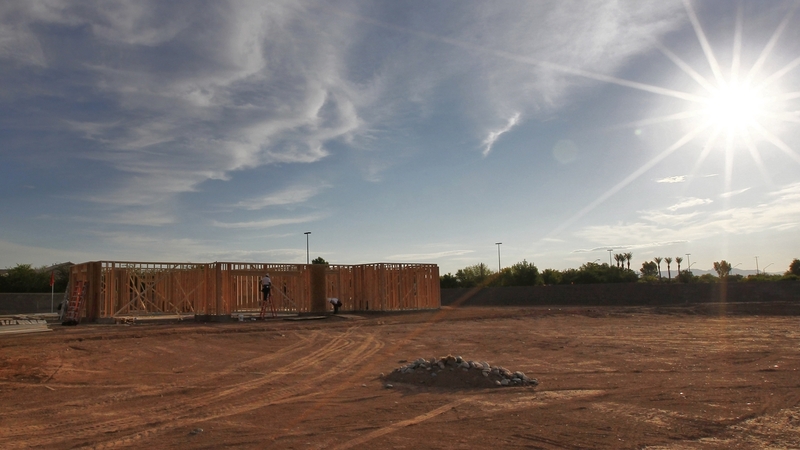 Developers in Phoenix are scrambling to keep up with another frenzied demand for housing. During the Great Recession, homebuilders in the suburbs abandoned neighborhoods that were only half-built. These so-called zombie subdivisions left a ring of unfinished construction around the city. But now, the zombies are waking up. When the housing party ended five years ago, Phoenix was left to clean up the mess. Since 2009, the city has received $116 million in federal stimulus money, teamed up with builders and gotten to work on reviving housing developments like Gordon Estates in South Phoenix. In Gordon Estates, work crews are putting the final touches on 14 new homes that are just about move-in ready. Chris Hallett, who runs the Phoenix's Neighborhood Services Department, says he's running out of foreclosed properties to resurrect. "The inventory out there is slowing," Hallett says. "That's a sign of a good economy, and that's a sign that our work here is just about done." The housing recovery in Phoenix is in full swing and the supply of existing homes can't keep up with buyer demand. In response, builders began snatching up empty lots late last year. The easiest targets were the zombies already equipped with sewers and streetlights. "The opportunity to acquire distressed lots or failed communities is long gone," says Dave Everson, president of Mandalay Homes. "They're now in the hands of people that are either building them or are in the process of getting started to build them." Everson's company helped finish Gordon Estates, and Everson himself has bought a half-dozen distressed subdivisions. And he has reason to be optimistic about their future: The number of new-home sales in April was up 27 percent compared with the year before. During the recession, builders recalibrated: They drew smaller floor plans, cut back on fancy amenities and designed denser neighborhoods. "As an industry we tooled up for that," Everson says. "But what we are finding is, as the market's healing, we probably underestimate consumers' desire for a little bit larger home." On average, new homes sold were about 30 percent larger than existing homes that were, says Mike Orr, a housing researcher at Arizona State University. Parents need bigger houses to accommodate their unemployed adult children, he says. But more likely, it's just industry picking up where it left off. "I think the city planners would like to have much denser city centers with tall buildings," Orr says. "But the builders know how to make money doing it the old way, going out on the outer fringes." Around Phoenix, about 350 subdivisions are actively selling new homes. In a normal market, that number is more than 600. But it takes time to recover, Realtor Greg Swann says. Why Buy A House When You Can Buy A Mountain? "This year is definitely better than two years ago," he says, "but there are limits to the enthusiasm that you can express for this." Two years ago, in a zombie neighborhood in West Phoenix, the only things you would see were fire hydrants emerging from the desert floor and sidewalks leading to nowhere. But today, you will find crews working on about a dozen big homes. And when construction is really moving in Phoenix, Swann says you'll know it. "If there's a truss on a truck in front of you every day when you're driving on the freeway," Swann says, "if you're trying to angle around that truss because you can't see, then they're building houses."